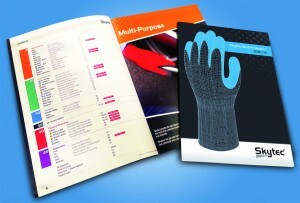 MANCHESTER, UK, 27th November 2012 – Globus, experts in hand protection solutions has announced the launch of the new Skytec Glove catalogue for 2013/14. Featuring thirteen new Skytec products, the comprehensive sixty page catalogue reflects the company’s commitment to providing distributors and consumers with cutting-edge solutions to hand protection challenges. To aid the selection process, the catalogue is separated into easy-to-read product sections, each categorised according to different areas of risk and hazard. An overview on PPE Directives, European Standards and a guide to the various glove liner and coating components contribute in making the catalogue a valuable resource for anyone involved in the selection and sourcing of industrial hand protection products. Globus serves customers in the UK and Ireland with professional hand and arm protection solutions. Globus’ portfolio consists of products from the Showa Best and Skytec ranges and it is committed to a zero tolerance approach to product and service deficiency. Globus is a privately held company and is based in Manchester, UK. For news and information on Globus, please visit www.globus.co.uk. IOSH flexes its muscles with ‘Fit for the Future’ 2013 conference progr... Are your safeguards as safe as you think?